.Here are instructions for replacing a turntable belt. 2.) Remove platter just beneath mat. 2b) Some platters are "press fit" onto the center shaft and seemingly can't be removed, the trick is to lift up on the platter while simultaneously lightly tapping on the center shaft with the handle of a screw driver. 3.) Use a rubbing Alcohol soaked cloth to clean outside of large 'lip' or rim underneath platter and the (usually) brass pulley shaft on platter drive motor which should now be visible. 4.) 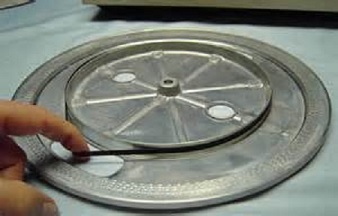 Install belt around the rim underneath platter as shown in the picture below. Belt should be somewhat snug without falling off. 5.) Optional: Clean then Lube main center platter shaft of turntable with 3-in-1 oil or similar. 7.) Look through 'access window' in platter and rotate platter until motor pulley becomes visible. 8.) Stretch belt from platter rim over to far side of motor pulley. 9.) Re-install mat and start player.